What lies beyond the China of fast-paced cities and hypermodern culture? Horatio Clare journeys to the rural province of Yunnan, where age-old beliefs and traditions offer a glimpse of the country’s soul. Yunnan means ‘south of the clouds.’ And as I arrived in this southwesternmost pocket of China, so it appeared to be. The Han Dynasty invaders who named this province could never have imagined that, one day, much of the rest of the country would be covered in a thick gray veil of pollution—that you could travel from Chengdu in the center to Beijing in the north and never see blue sky. But I flew in the other direction, south, and as we came down toward Dali, one of Yunnan’s prettier towns, lagoons appeared through the vapor below us. To the west, great peaks thrust up, outliers of the Himalayas. We circled lower and there, suddenly, was the deep blue of Erhai Lake and the shining green forests of the Cang Shan range, known as the Azure Mountains. To be met off the plane by sunshine, birdsong, and butterflies seemed almost unbelievable, because I had traveled in China before, the China of mighty cities and poisoned air. In the past 35 years, an astounding 500 million people have moved from rural areas to vast urban centers—migration on a scale without precedent. In those cities I had seen much of China’s power, appetite, and prowess, but no clear sky, no wild creatures, nothing of nature’s bright wonder. Aside from couples dancing by the light of digital billboards in Shanghai, I had glimpsed little of the nation’s soul. So this was to be a search for the spiritual, the beautiful and true: a journey from Yunnan’s flat farmlands down near the border with Myanmar, up to the high plateaus of the eastern Himalayas. The route would take me due north along rising roads, traveling from Dali up into the hills and then higher, all the way to Tibet and Shangri-La. I would meet shamans, priests, and wise women, who would show me the ancient currents of belief that still pulse at the edges of the world’s most rapidly modernizing country. Out on the water men fished from boats, and a bird of prey turned slowly on the thermals. Between the mountains and the lake stood three figures, tall and slender, like pale ghosts. “The San Ta Si!” Jie said, “Look! A thousand years old.” The San Ta Si are pagodas, each over 140 feet high and intricate as carved ivory. Constructed in the ninth century, they are expressions of the art and faith of the Bai people, whose Nanzhao and Dali kingdoms endured from the seventh century until 1253, when Kublai Khan’s Mongol warriors came down from the high plateaus. The Mongol empire fell long ago, but over a million Bai people remain—one of several minority ethnicities that thrive here, far from China’s main cities. The villages of Xizhou and Zhoucheng, at the northern end of Erhai Lake, are today home to Yunnan’s greatest concentration of Bai architecture and custom. My base from which to explore them was the Linden Centre hotel in Xizhou, a 1948 courtyard house built by a merchant named Yang Pin Xiang that today feels like a living work of art. Its wooden balconies, doors, and lintels are networks of exquisite carving, a Bai specialty. “It’s a national relic,” said Jeanee Linden, the center’s Chinese-American co-owner. “During the Cultural Revolution the building was occupied by the army, so the Red Guards never got in,” she said, explaining why the wooden birds, fish, dragons, and flowers had escaped vandalism. The Cultural Revolution left very few other examples of Bai art and culture standing, and a postrevolutionary desire for progress meant such historic structures were, until recently, not much valued. “Too many things in China have been taken down in the name of modernity,” Jeanee said. At the Linden Centre, careful preservation and delicate restoration have saved a marvel for the world. Jeanee and her husband, Brian, count Western diplomats and Chinese officials among their guests—all attracted by the Lindens’ determination to form a bridge between Occident and Orient. “But in the last two years the market has shifted,” she said. “Chinese people are also seeking this kind of experience now. A lot of them feel out of touch with rural life.” That rural life comes right up to the windows of the Linden Centre’s charmingly creaky rooms. Beyond mine, men and women cleared paddies of the remnants of a rice crop, replacing it with garlic bulbs. As a farmer’s son, I do not romanticize working the land, but the easy solidarity of the sowers was beguiling. 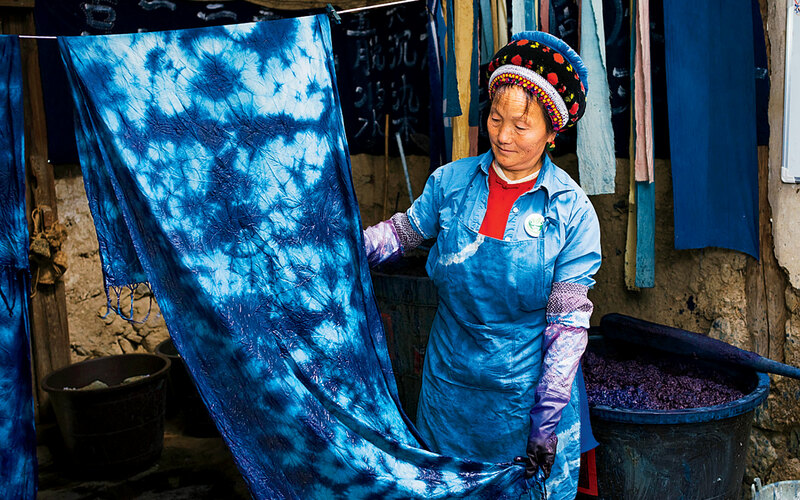 In nearby Zhoucheng village I passed a gentle hour learning tie-dyeing, a Bai specialty. Ladies in traditional dress chattered and laughed as they stitched patterns into cloth before plunging it into vats of dye. Their elaborate costumes are not worn just for the benefit of visitors: the streets throng with women in magnificent Bai bonnets. Jie, my guide, explained that the tassels on these hats represent the wind, and are worn long by unmarried women, short by those who are married. The hats’ crescent shape symbolizes the moon reflected in Erhai Lake; white ruffs denote the snows of the Cang Shan peaks. Thus clothes are symbolic reflections of place, culture, and individual status. Similarly, Bai villages are mosaics of local gods and symbols. “There are gods for kitchens, wealth, study, chickens—gods for everything!” Jie said. “And all the local gods have birthdays.” She pointed out zhi ma, the woodcut images of these gods that speckle many Bai doorways and houses. In temples, effigies of Buddhist, Taoist, and local, or Benzhuist, deities sit side by side: the Bai see no contradiction in revering figures from different traditions. In the evenings, men hurry through the streets with bundles of thick red incense sticks like cartoon dynamite and baskets of vegetables, the corporeal and the spiritual interwined. That night, our supper was spiced pork, noodles, rice, and winter greens at the house of the Lindens’ neighbor Shi Jiazhen. The food of rural Yunnan is a treat for Chinese visitors as much as it is for Westerners, and along with Jie and the Lindens, I gorged. Outside the hotel the night air smelled of earth, straw, and the cold of starlight. 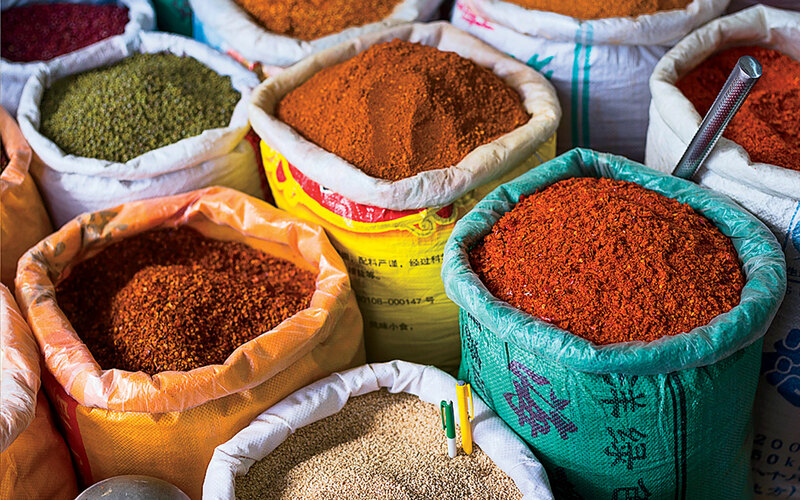 The following morning I visited Xizhou’s market, where I found myself among men selling the ingredients of every Chinese meal you ever ate, from live chickens to fresh fungus. All my fellow visitors were Chinese, many of them young—the generation whose parents were among the 800 million people lifted out of rural poverty in the decades following 1978, when the government of Deng Xiaoping began relaxing its economic policies. Many of these urbanites now visit the countryside for pleasure, either returning to their ancestral villages or exploring picturesque areas easily accessible from their home cities. In the center of Xizhou I watched one such young, cosmopolitan couple taking multiple selfies, performing the now-global rite of digitally confirming their vacation. After lunch I took the road north with a new guide, Zhao Ming, who told me to call him Jack. 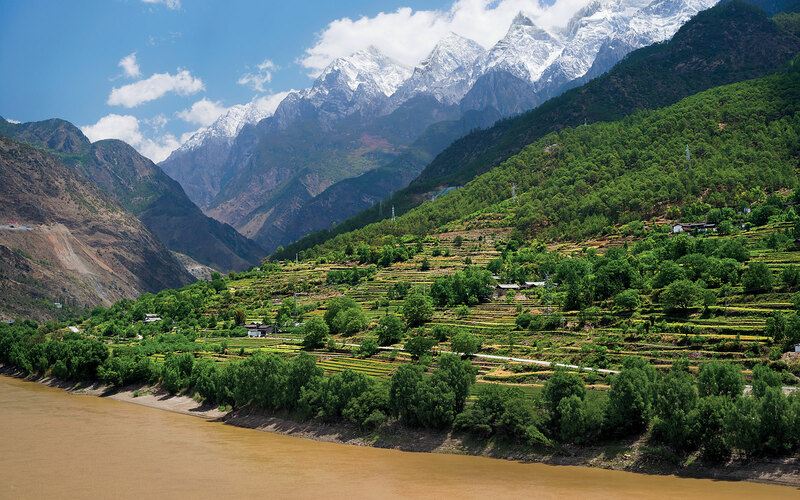 The highway climbed through the mountains to Lijiang, a town on a plateau below Yu Long Xue Shan, or Jade Dragon Snow Mountain—its name derived from the fact that it can look like a green dragon lying on its stomach, covered in snow. A ferocious peak of spined rock and ice, Yu Long is sacred to the indigenous Naxi people. They insist it has never been climbed. 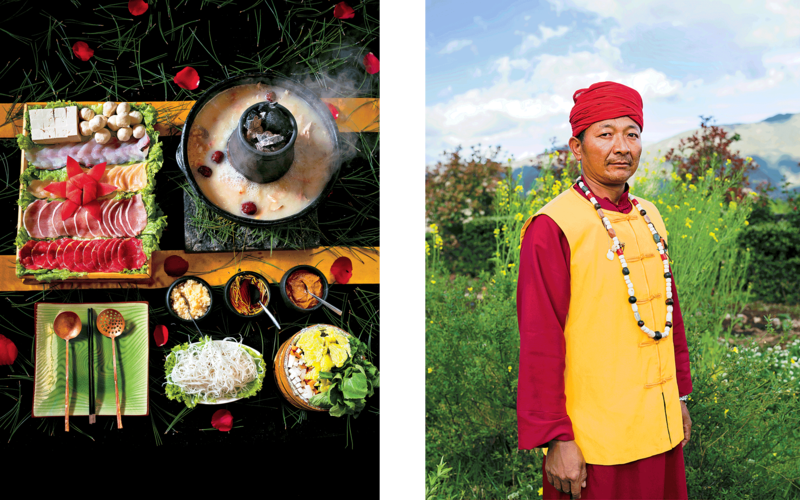 The Naxi are animists, worshippers of nature. They have no temples. Their religion, Dongba, meaning “wise man,” is led by shamans, and passed down in pictographs that resemble Egyptian hieroglyphs—the last such script still living. 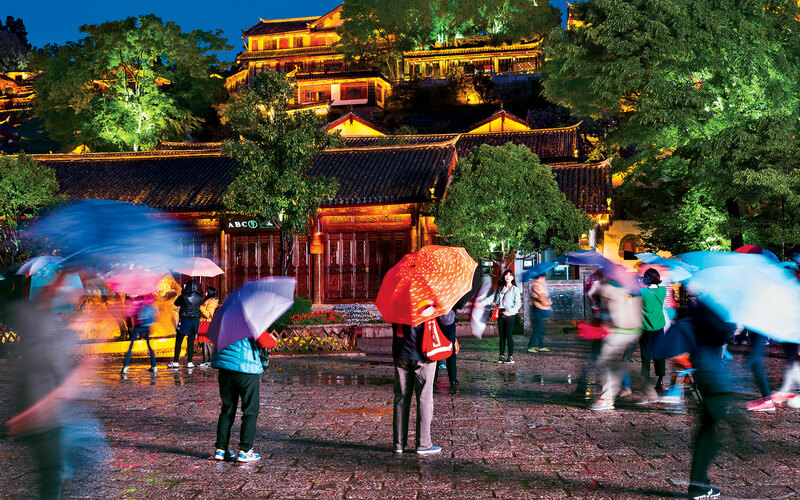 Lijiang’s big attraction is its old town, Dayan. A winding maze of canals, passages, boutiques, cafés, and houses crested with flipped-up cornices like the wings of pagodas, it is an entrancing place to wander in the light of a bright morning. Where the 800-year-old streets meet the new town we found the falcon market, a cluster of men with birds of prey on their fists. There was a hypnotic beauty and power in the birds’ barred chests, clutching talons, and furious eyes. I was tempted to buy a captive and release it, but falconry here dates back to the time of the Mongols, who introduced hunting with golden eagles. It would have been quixotic to go against such an old tradition, and anyway the goshawk seller would surely have set out immediately to trap another one. Another kind of hunt takes place in Dayan come evening, when the streets are a tumult of young tourists from elsewhere in China, thunderous with the music of bars, afizz with drink and flirtation. “One-night-stand street!” laughed Guo Jian Zhong, a Lijiang resident I met in a trendy tea shop who told me his life had been changed by a Christian missionary. He said he avoids Dayan at night, preserving his chastity for the wife he hopes to meet. Chris DeLacy, a young American working in China who is familiar with Lijiang’s bar scene, echoed this sentiment. “Don’t mess with the Naxi girls. Two of my friends had relationships with them. When they tried to break it off they both got stabbed!” Neither wound was serious, but both are indicative of the strength of Naxi pride. From the early 18th century, when direct imperial rule was imposed on the Naxi, the Han ethnic majority’s system of arranged marriages caused them great distress. The Naxi, who allowed boys and girls to mix freely and to choose their own romantic partners, fought the new laws in a terrible way. Lijiang became a suicide capital, with many hundreds of couples eloping to Yu Long Xue Shan to meet their ends there, believing they would ascend together to a heaven of everlasting youth and love. Suicide became a romantic cult, with participants treating it as an eternal-marriage vow. The American botanist and anthropologist Joseph Rock, who lived at the foot of the mountain in the early 20th century, recorded six couples taking this fateful course together in a single day. Today, Naxi women sit in the old town’s square, redoubtable in blue Mao caps and bulky traditional coats that are said to make them resemble frogs. Frogs, being great breeders, are held sacred by the Naxi, who were historically outnumbered by the southern Bai and the Tibetans to the north. Modern China, dominated by the cities, the Han, and the Communist party, has in many ways preserved Naxi culture from its traditional foes. Minorities were persecuted during the Cultural Revolution, but in the post-Mao era, the government promoted ethnic diversity and local traditions as a means of boosting national harmony. The Dongba religion had been so weakened by the revolution that it was no longer seen as a threat by the authorities. 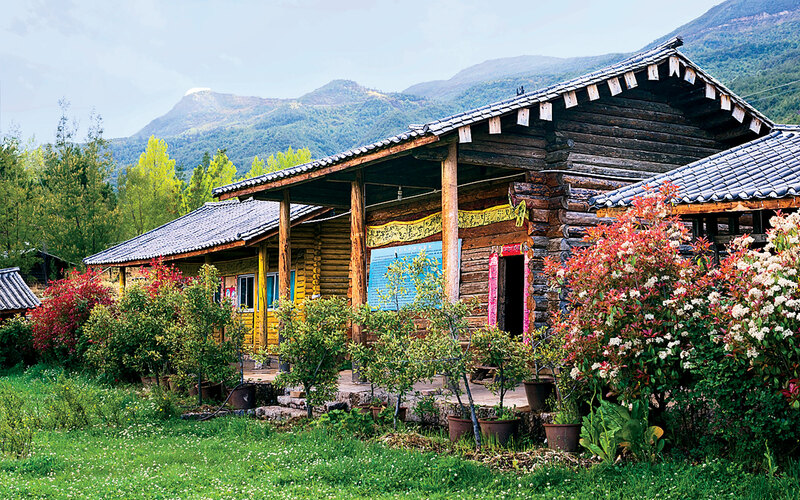 As time passed, the Naxi way of life, like that of many other minority groups, grew to be seen as a relic, or a ready-made tourist attraction. 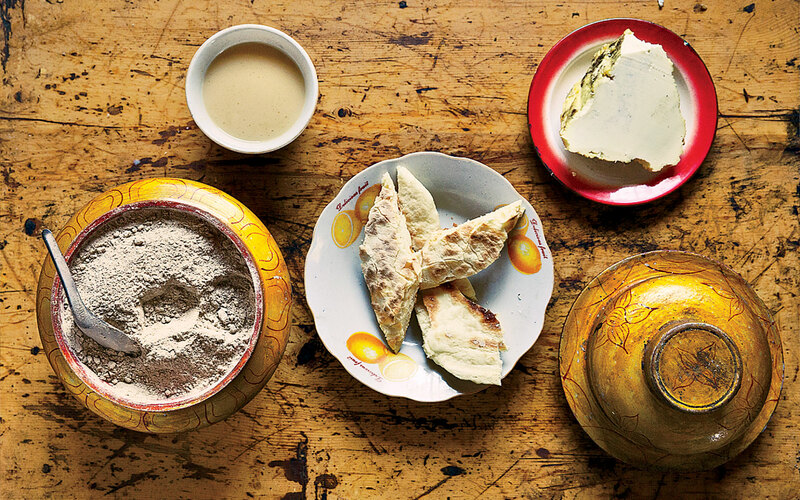 These traditions are one reason why international tourism is booming in Yunnan. Along my route from Lijiang to Shangri-La, high-end chains like Aman and Banyan Tree have opened resorts—so now this dramatic trail can be traveled in easy luxury. A variety show about Naxi culture called Impression Lijiang takes place daily in a theater below Jade Dragon Snow Mountain, an extravaganza created by the film director Zhang Yimou, who made House of Flying Daggers. Five hundred actors perform sketches involving horses and drums against the backdrop of the sacred peak. Kitsch and bombast—the very image of what the historian Eric Hobsbawm termed “the invention of tradition”— do not detract from the sweetly moving relationship between the cast and the audience, who waved at each other throughout, and joined at the end in a mass wish for peace and harmony. With the crossing of the Yangtze we had entered what is officially known as the Tibet Autonomous Region. To this traveler’s eye, it looked like another country altogether. When finally we topped the Tibetan Plateau, almost 10,000 feet up, we found a new world, a place of faith, to judge by the Buddhist stupas and their streaming prayer flags, and of mysteries, by the feeling in the frigid wind. We passed black yaks, which seem to wear fur coats draped over their shoulders; and black dris, which are female yaks; and black dzos, which are half yak, half ox; and hairy black pigs; and black choughs and ravens. The mountains marched in phalanxes through the searing light, under a Himalayan sky so blue it seemed to roar. This was Gyalthang, the muleteer’s gateway to Tibet. Gyalthang was originally a vast meadow where traders fed and refreshed their horses; the town of the same name was a market and a key point on the Tea Horse Road. In a stroke of marketing genius the Chinese government in 2001 rebranded Gyalthang as Shangri-La, after the fictional mountain paradise of James Hilton’s 1933 book Lost Horizon. Today, the place has the hectic activity of a town on the up. Everywhere men were working wood in a meticulous mass reconstruction effort. “For the Chinese, Tibet is a real dream,” Dakpa said, smiling gently, as we watched that dream being built up around us. Shangri-La thus presents an extraordinary double vision: an old town being rebuilt in Tibetan style with the aim of luring tourists, primarily Chinese; a new town adjacent to the old being built with the aim of populating Tibet (no Tibetan would dare say “colonizing”) with arrivals from the rest of China. A railway line linking the plateau to Lijiang is under construction, and everywhere there are cameras and police, ensuring this progress is frictionless—or at least unopposed. Talking politics is a hushed business in China. 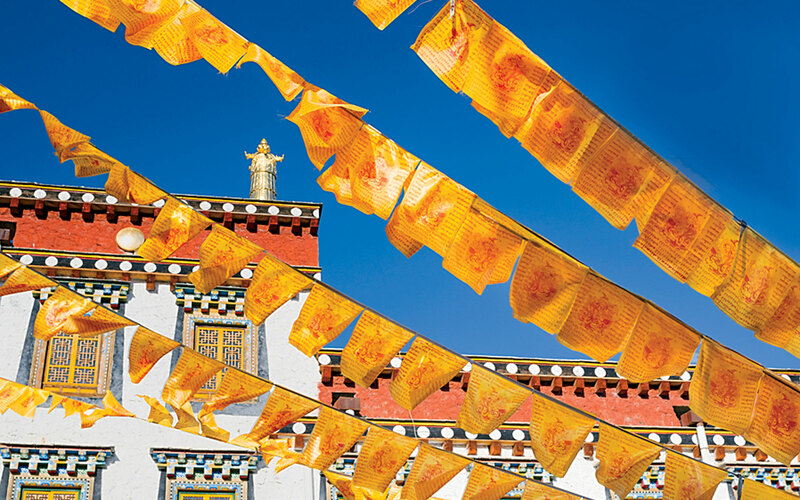 In Tibet, which was invaded by China in 1950, several people I spoke to begged me not to write anything that might be construed as political criticism. Judging by their laughter, it seemed no Tibetan expected me to be uncritical of their national drink: Tibetan dri- butter tea, widely and incorrectly known as yak-butter tea (yaks, being male, don’t produce milk). 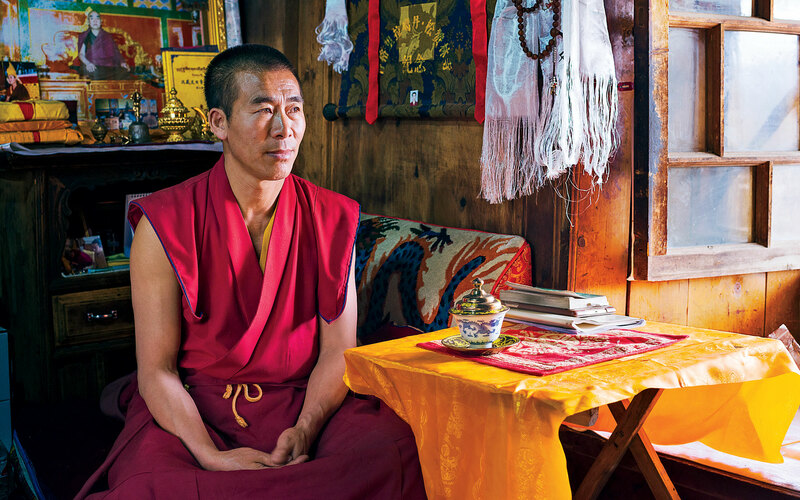 At the Ganden Sumtseling monastery on the outskirts of Shangri-La, a senior monk named Nyawang Jhampa made what looked like a classic English brew but was sour and very salty, with gaseous overtones. I have a strong stomach, but two sips were too many. It seemed my search for ancient soul in modern China had taken a sad turn until we went out into the Kochi, or “hidden” valley, to visit a Tibetan farm. 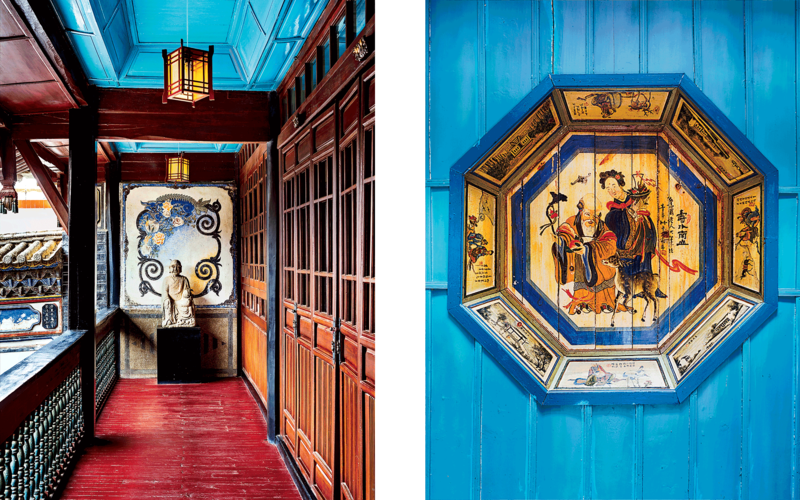 Tashi Lhamu’s traditional house is a huge, decorated wooden marvel. It overlooks a farmyard where Tashi was feeding her pigs. Tashi is a small, energetic woman in a red baseball cap. Her husband was working in the fields, she said, leaving her to a relentless round of feeding their children and animals, offering incense and prayers, milking dris, collecting firewood, shepherding livestock, cleaning, talking, and, finally, briefly sleeping. I have rarely met anyone so obviously in love with life, despite such a grueling routine. “I never get tired,” she laughed. “I love my animals—I never want to sell them. Winter is hard. With the snow the animals can’t go out, and in summer I worry about the pigs raiding the barley. But the more work I do, the more food we have—and then I can offer some to the monastery, and to other people!” She made this last point with arresting pride and relish. Tashi lives on a harsh frontier. At 9,000 feet the sun is a blazing flail. In winter the winds are lethal. 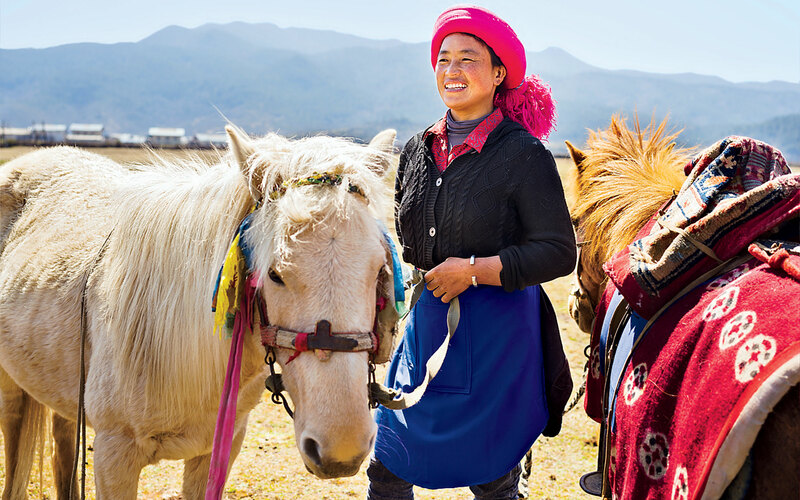 There is an ethereal beauty to the plateau, where the tink-tonk of cowbells, choughs’ whistles, and roosters’ crows make up the soundscape, but what Westerners would recognize as Tashi’s rewards are few. During the celebration of the new year she visits hot springs for a week, and in June there is horse racing, which she loves. Her huge pleasure at producing a tiny surplus to give away absolutely seized me. While there are people who live and think like this there is hope for humanity—there must be, I decided. On the flight back to my own world I thought of her, and of Yong the shaman, and Nyawang the monk, people who to us seem materially impoverished, but who feel their lives are rich. I gazed down at their plateaus and mountains. There was no sign of any habitation, only the indifferent wilderness. In these distant places you feel the proximity of spirits; indeed, you may meet people who live with them, and who know wonder as we might know a neighbor, and you may sit and talk with them, still. Fly to Dali from Shanghai or Beijing via Kunming or Chengdu. The Chinese embassy’s website may list four business days as the processing time for obtaining a tourist visa (L visa), which is required to enter China, but it is best to apply one to two months before your travel date. Make sure your passport is valid for six months after your trip dates. Amandayan Perched on a hill overlooking Lijiang’s old town, this property offers 35 rooms, all with the Aman brand’s typical luxuries, clustered around inner courtyards. Doubles from $440. Arro Khampa A discreet refuge with comfortable rooms, Tibetan food, and classes in language and painting at the adjacent Thangka Center. Shangri-La; doubles from $200. Banyan Tree Ringha The rooms here were once traditional Tibetan houses. Each has two floors (bath and shower downstairs) with private terraces and views across the valley. Shangri-La; doubles from $440. Linden Centre The comfortable, creaky rooms at this traditional Chinese inn place an emphasis on simplicity and beauty. Xizhou; doubles from $150. 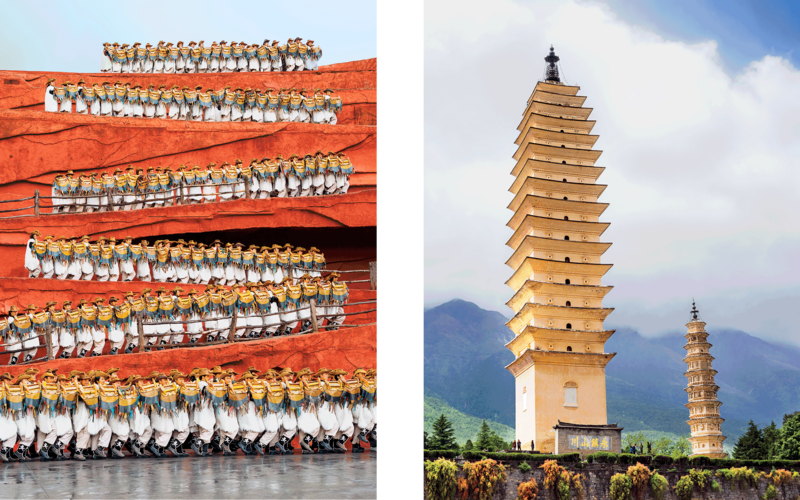 Imperial Tours The writer and photographer both used this operator, which provides an extensive network of contacts, first-class service, and thorough knowledge of Yunnan and Tibet. Packages include hotels, guides, and transportation. Wild China Based in Beijing, founder Mei Zhang is a Yunnan native and specializes in taking travelers off the beaten path.